The American criminal justice system has long wrestled with evolving societal and scientific understandings about how best to deal with crime and criminals. Should we punish or rehabilitate? Do we permanently incapacitate criminals or do we prepare them for reentry into society? 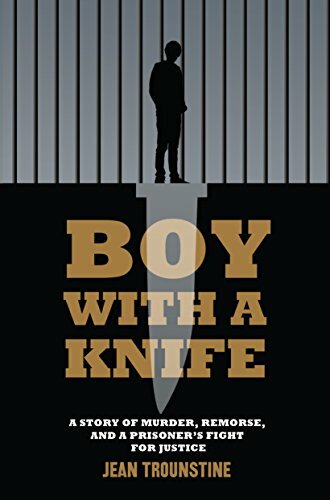 Jean Trounstine's remarkable book Boy with a Knife explores these questions in the ever-changing context of the juvenile justice system, where the stakeholders must also know the unknowable: Where does the child end and the adult begin? On April 12, 1993, 16-year-old Karter Kane Reed committed a shocking crime that rattled the working class community of New Bedford, Massachusetts, and the upper-class community of Dartmouth, Massachusetts. The son of an imprisoned father and alcoholic mother, Karter entered Dartmouth High with two friends to rectify a wrong done to one of them. They entered a classroom in the middle of the school day, determined to finish a fight that had begun the night before. In the chaos of a classroom disrupted, after his co-defendant threatened one of the rival students with a bat, Karter stabbed that student. The boy, Jason Robinson, died from a stab wound to the stomach. Karter was bound over to be tried as an adult and was convicted of second-degree murder. He was sentenced to life imprisonment with the possibility of parole. At 17 years of age, he was sent to MCI-Cedar Junction (aka Walpole State Prison) to begin serving his time. Karter's story could have ended there: another convicted murderer sent to prison for life. Instead, as he grew up in prison, Karter took advantage of every possible opportunity to atone for his misdeeds, rehabilitate himself, and to prepare for the possibility of returning to his community. Ultimately, Karter had to sue in order to be released, and he left prison on lifetime parole in his late 30s. He earned a community college degree, excelled in a job where he works night shifts, and hoped to become a voice in the national conversation about the juvenile justice system. Trounstine's book is not just about Karter's story, however. Interwoven throughout the text is a thorough exploration of the research, literature, and statistical realities of the juvenile justice system. One statistic jumps right off the page: The United States is the largest jailer of juveniles in the world. How can this be? In the 1990s, when Karter committed his crime, there was much talk of “superpredators” and out-of-control violence among teenagers, particularly African Americans. Newt Gingrich famously said, “There are no violent offenses that are juvenile.” Trounstine makes it clear, though, that the over-incarceration of juveniles in adult prisons, of which Karter, a white man, was a “beneficiary,” has had a net negative impact on American society. Scientists now know, for instance, that the teen brain is decidedly different from the adult brain. Trounstine, through Karter's story, uses this fact to illustrate two very important points about the juvenile justice system. First, that the concept of criminal responsibility, as it exists in the American criminal justice system today, does not translate properly into the juvenile system. Teens, by virtue of their physiologically underdeveloped nature, simply cannot be treated as adults for purposes of determining criminal responsibility. The second point is the central theme of the book and of Karter's life. On the question of rehabilitation, all of the research indicates that teens are highly amenable to positive intervention and education. And on the flip side, juveniles are very susceptible to negative influences. Putting these concepts together leads to a simple but crucial conclusion: The juvenile justice system must devote significant resources to the rehabilitation of young offenders. It has been said that two wrongs don't make a right. Can the juvenile perpetrator of a heinous act be salvaged such that he or she can become a productive member of society? Trounstine says yes, relying on recent Supreme Court decisions, and argues convincingly that long-term sentences for juvenile offenders do more bad than good. Anyone who is interested in learning more about the American juvenile justice system should read Trounstine's Boy with a Knife. The author successfully walks the fine line between respecting the victim of Karter's terrible crime and advocating for the salvaging of the errant juvenile offender. Advocating for the rehabilitation of violent offenders is a thankless task, but in a forward-looking society, it is important and necessary.